What's the deal with glass slippers? Who decided that should be a thing? We're honestly not sure we could imagine a more uncomfortable slipper. Maybe if it was made out of poison ivy or something! Where's the breathability? Where's the arch support? And two, glass has exactly zero cushioning. One night of wearing these bad boys and you'd have blisters on every toe. 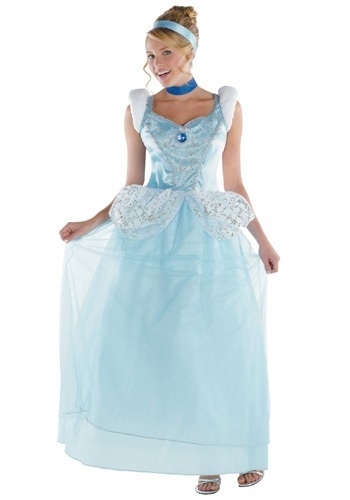 Thank goodness Cinderella had a strict curfew. Slippers are supposed to be comfortable! That's why dogs fetch slippers. That's why you wear cozy slippers sitting in front of a fire drinking hot cider. It's just the way of things. Now Cinderella comes along and tells us slippers are best when they're made out of glass? Oh really, Cinderella? Really? She claims she got them from her fairy godmother, who conveniently hasn't been around much and isn't even on Facebook! We're beginning to have our suspicions. It's possible Cinderella poured all her money into glass futures and now needs demand to skyrocket. A good plan too, when she's rocking this dress, who's going to say no? This dress is a classic show stopper with a floor length skirt that's layered with light blue fabric. It has sparkly detailing on the bodice and poufs. And best of all, this dress doesn't turn back into a pumpkin at midnight (yes, we know it wasn't the dress that turns back into a pumpkin, but just go with us on this). If you feel like Cinderella but even more ready for royalty, this is the dress for you. You can take the glass slippers. You can wear them all night, forget curfew. Show that prince your funky moves!